Tourism Minister, Moosa Zameer has said that the government funded airport in Noonu atoll Maafaru will be completed and test flights will begin next month. The project was contracted to a Singapore company last December. 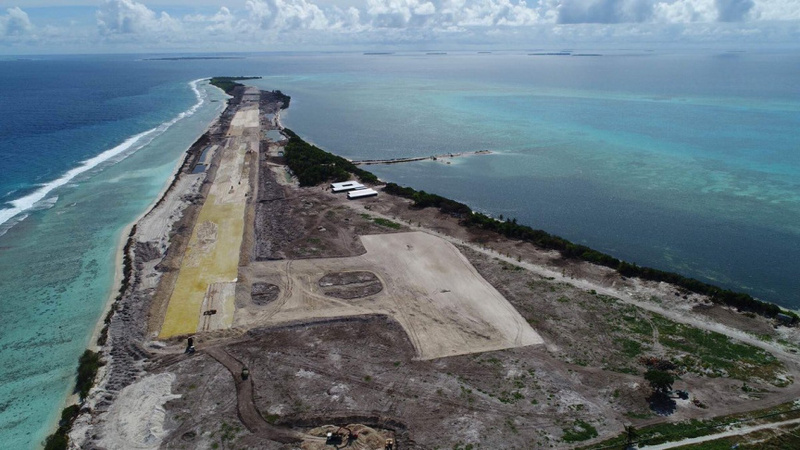 On visit to Maafaru to observe the progress of the project, Minister Zameer said that the airport will be completed next month and after the test flights, the airport will start operations in August. He said that the obstruction to the project is weather. The pre-tarmac work on the runway is underway at Maafaru and is almost completed. And the tarmac work will begin in the next five days. Maafaru Airport runway is set to be a 2.2 km runway capable of accommodating A32 and Boeing 737 planes. Upon completion, the airport will have a VIP terminal aside from a regular terminal along with parking facilities for private jets.